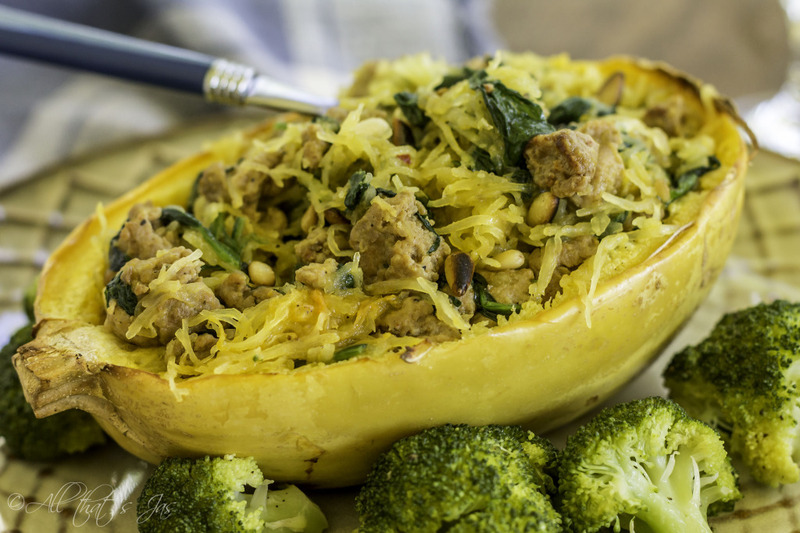 If you have never had spaghetti squash before, this is definitely the way you should first try it. Our Paleo diet was more or less successful given that, as I reported earlier, Husband lost weight while I gained some. That’s the lesser part, but more importantly, we are making steps toward changing our eating habits and making healthier choices. If I’m going to be honest, it will take a lot of discipline, lots of tweaking, and change of my daily schedule. During our Paleo challenge it was hard for me to balance my day job, blogging, photography, family time, house chores AND making everything paleo. “Ain’t nobody got time for that!” was my new hymn. But, if we were going to do it we were going to do it right. I love spaghetti squash plain with olive oil, garlic, and feta cheese but this recipe from paleogrubs.com is my new favorite. I made a few minor changes only to use the ingredients I already had on hand. Preheat the oven to 400 degrees Fahrenheit. Pierce squash with a skewer few times then place it in the microwave for 5 minutes to soften. Cut the squash in half lengthwise. Scoop out the seeds and discard. Place the halves, with the cut side up, on a baking sheet. Drizzle with olive oil and sprinkle with salt and pepper. Roast the squash in the oven for 45-50 minutes or until you can poke it easily with a fork. Let cool until you can handle it safely. Meanwhile, prepare the greens by removing the center stems if necessary and either tearing or cutting up the leaves. Heat the olive oil in a large skillet over medium heat. Add the onion and garlic and sauté for 4-5 minutes. Add the sausage and break apart with a spatula to crumble. Cook for 15 minutes, stirring regularly until the sausage is browned and cooked through. Add the greens, stir and cook for a few minutes more to wilt. Remove from heat and set aside. Once cooled, scrape the insides of the spaghetti squash with a fork to shred the squash into strands. Transfer the strands into the skillet with the sausage and toss to combine. Season the mixture with salt and pepper to taste. To serve, top with pine nuts and parsley. Preheat the oven to 400 degrees Fahrenheit. Pierce squash with a skewer few times than place it in the microwave for 5 minutes to soften. Cut the squash in half lengthwise. Scoop out the seeds and discard. Place the halves, with the cut side up, on a baking sheet. Drizzle with olive oil and sprinkle with salt and pepper. Roast the squash in the oven for 45-50 minutes or until you can poke it easily with a fork. Let cool until you can handle it safely. Meanwhile, prepare the greens by removing the center stems if necessary and either tearing or cutting up the leaves. Heat the olive oil in a large skillet over medium heat. Add the onion and garlic and sauté for 4-5 minutes. Add the sausage and break apart with a spatula to crumble. Cook for 15 minutes, stirring regularly, until the sausage is browned and cooked through. Add the greens, stir and cook for a few minutes more to wilt. Remove from heat and set aside. Yum! I love spaghetti squash, thanks for sharing!